Le Fate on viehättävä asunto tyypillinen 11th century Tuscan kivi maalaistalo, kauniisti kunnostettu ja sisustettu, ympäröivät oliivi-ja viinitarhoja, aivan pieni keskiaikainen kylä Montefioralle, sydämessä Chianti. Kodikkaassa huoneistossa, jossa voi majoittua 2 + 2, on suuri täysin varustettu keittiö, kahden hengen makuuhuone, kylpyhuone kylpyammeella, yläkerran olohuone, jossa on kaksinkertainen piilopaikka, WiFI sisä- ja ulkotiloissa, terassi ja puutarha, josta on upeat näkymät. yksityisen uima-altaan käyttö 15 minuutin ajon aikana, ja omistaja ajaa ruoanlaitto-studio samassa kiinteistössä. On myös totta, taivaan Foodies: Samassa rakennuksessa omistaja kulkee tunnettu kokkikoulu, jossa voit oppia salaisuuksia italialainen keittiö osallistumalla hänen käytännön luokissa. Rauhallinen ja rentouttava tunnelma maan kotiin ja kauneus ympäröivän Toscanan kukkuloille tekevät tästä paikasta paratiisin rauhallisuuden. Se sijaitsee keskeisellä paikalla moniin muihin kyliin ja kaupunkeihin Chianti: Greve (5 min), Panzano (15 min), Radda, Castellina (30 min), Badia Passignano (20 min), Volpaia (30 min). Firenze on 45 minuutin ajo, Siena 60 min, San Gimignano 45 min ja Volterra 90 min. Samassa monimutkainen on www. pastaalpesto. com: n kokkikoulu. Spend more time here next time!! We arrived in the dark hours so we weren’t able to see our surrounding area right away. We climbed the stairway and opened the door to our private apartment!! My wife and I were blown away by the simplicity and details of this 11th century dwelling!! Stefania has made this a very unique experience and we both wished we had booked more time immediately. The kitchen is old but very functional, she has waiting a bottle of the local Chianti Classico and 2 glasses on the hefty kitchen table. There is a loft area which hides all sorts of treasures and beautiful scenery out the multiple very clean windows. Past the kitchen and down the tiled hallway is our bedroom with a nice queen size bed and clear double window. Continuing down the hallway and up a few steps is the bathroom with simple freestanding tub and shower kit, sink, toilet and bidet, complemented by another small but very clear window. We woke in the morning and opened the double window to sounds of birds and distant voices in hilltop village of Montefioralle. Surrounding this very old farmhouse are lush fields of olive trees and vineyards and minus the vehicles and occasional power line you can imagine just what it was like a long long time ago. Stefania is very attentive to respond to any issues or questions you may have. Our biggest regret was not staying longer or trying her cooking classes. If you want to step back in time and experience a true Tuscan experience then you should by all means make your reservation here. You will enjoy every minute of it!! Great place to calm your frayed nerves after driving through Rome. Wish I'd have stayed longer! Also enjoyed the cooking class. How often does one get to stay in a farmhouse built in 1100 a.d.? It was the ultimate Tuscany experience. The view is incredible. Stephania is extremely kind and cares about your comfort and overall experience. We want to come back and take cooking lessons. It was simply pleasure to have you here and can't wait to welcoming you again. I wish you a great rest of the trip! The property was charming and refreshingly different from hotels. Equally charming is Stefania and her cooking school. I have had success with her recipes and requests for them. The hilltop location permits walking through vineyards, forests and it is beside a small village with restaurants and cafes. We rented a car, touring the area and nearby Greve. Had a wonderful time staying in this apartment in Montefiorelle. 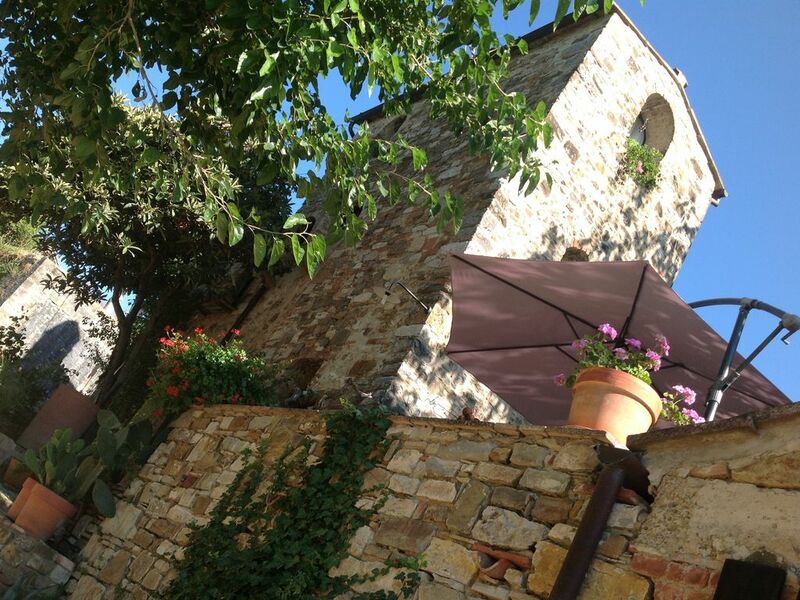 Great location for exploring the Chianti region and beyond. Wonderull restaurant in the town, and a quick drive (or somewhat longer walk) into the beautiful town of Greve. The villa itself was comfortable. The owner was very friendly and helpful. I would highly recommend it. Rates are for 2 people, additional guests € 20,00 p.p. per night. Clients of the cooking studio get a discount of 10%. Heating is not included.